The use of any tobacco product, including electronic smoking devices (ESD), is unsafe for young people. Most ESDs contain nicotine, a highly addictive chemical and can harm brain development, which continues until about age 25. ESD-use among youth is on the rise. In a 2017 national study on ESDs, 11.7 percent of high school students reported ever-use and 3.3 middle schoolers ever-use. In another study, 94 percent of youth were successful in purchasing e-cigarettes online, making it a highly accessible product. In Hawaii, the 2017 Youth Risk Behavior Survey (YRBS) reported high school ESD ever-use statewide at 42.3 percent and 45.3 percent on Kauai, which is almost 4 times the nation’s average. At the middle school level, ever-use of ESDs was reported for 2017 at 27.0 percent statewide and 30.0 percent on Kauai. 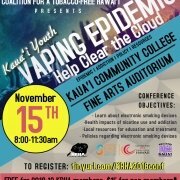 Statewide, Kauai has a higher ESD use among both high school and middle school youth. 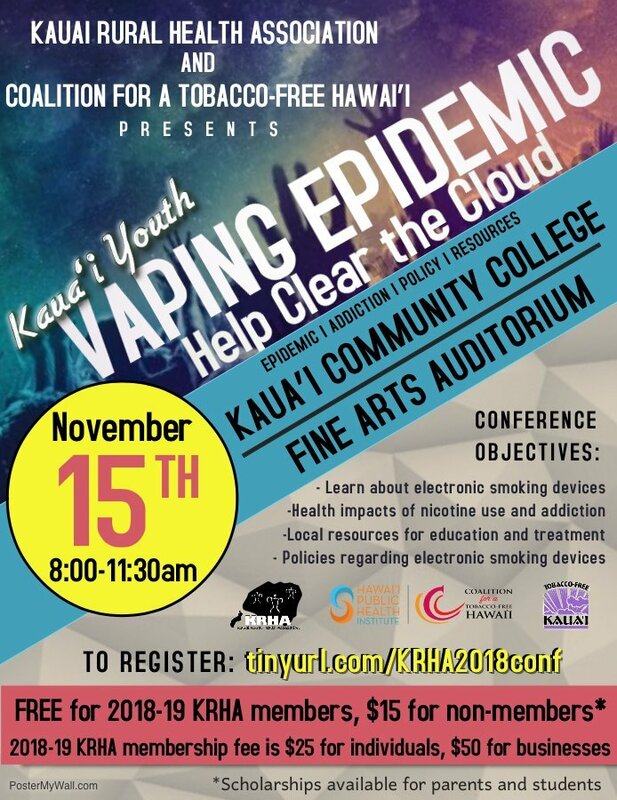 The need for education in the community and this conference is important since the CDC suggests parents, educators and health care providers can help reduce the use of ESD use by talking to young people.